Air Filter Regulator provides clean air pressure and equipped with a filter housed in a dripwell with gage port. Miniature Pressure Regulator is compact, low cost, and high performing pressure regulation of compressed air or air/water. Instrument Air Filter Regulators provide clean air pressure to pneumatic controllers, valve positioners, air cylinders and other equipment. 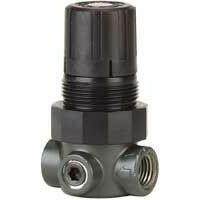 Do the MPR Miniature Pressure Regulators require a constant flow of air on the outlet? i.e. can they be used to pressurize something to a specific pressure? We have some tanks that need to be pressurized to specific pressure-anything over which would cause damage. If these regulators are set to the desired pressure, will they equalize out once that pressure in the tank has been obtained? 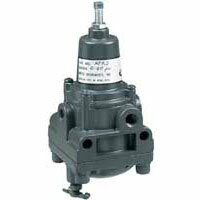 The MPR series miniature pressure regulators are designed for a constant flow of air on the outlet. They can limit or control the pressure going out, but they are not capable of monitoring pressure downstream of the device and controlling the system pressure accordingly.